This lovely home is ready to welcome it's new owners. Move in ready! Large master bath has ceramic tile floor, large corner tub, his and her separate walk in closets, double vanity, water closet and separate shower. Ceramic tile floor in second bath, hallway, family room, breakfast area and kitchen. Custom inlay tile pattern in family room. Kitchen includes fridge/freezer, range, dishwasher, and microwave with a large pantry for all your supplies. Laundry room, complete with washer and dryer, just off the kitchen. Breakfast area with bay window is open to family room and kitchen. Gas log fireplace in family with propane tank and gas ready to use. Garage turned into bonus room is a perfect place for rec room, media room, or whatever you would like for it to be. Covered rear patio for enjoying evenings in the privacy of your back yard. New complete 3 ton HVAC installed in October 2017. There is an outdoor workshop/storage building with ramp and covered area to the side. The property boasts a 1.5 acre lot with plenty of cleared space for outdoor games and activities. Parking for 3-4 cars in driveway. Roof is architectural grade shingles. Virtually maintenance free exterior. A new road is being cut on one side of the property, making this a corner lot. The plat shows Conifer Court under construction. Seller offering $1,000 credit to be used for Radon Mitigation. Table and Couch in Living Room are for sale and open for negotiation. Pine Ridge is a subdivision within the city of Winterville, Georgia. There are currently 0 Homes for Sale within Pine Ridge, with asking prices ranging from $0 to $0. The average list price per square foot of the available inventory in Pine Ridge is $0, which is the Winterville average of $168. The Average Sales price of all sold real estate in this subdivision for the past year is $159,515. Recent comparable homes have been selling for 97.79% of their asking price. Waterfront homes represent of the available Pine Ridge inventory. The population of Winterville, according to the 2010 Census, is 1,122. The total number of households in the zip code of Pine Ridge is 2,625, with an average household size for of 2.57 people. The total number of renter households within the zip code of 30683 is 628, which means that 76.08% of households in this zipcode are owner occupant households. 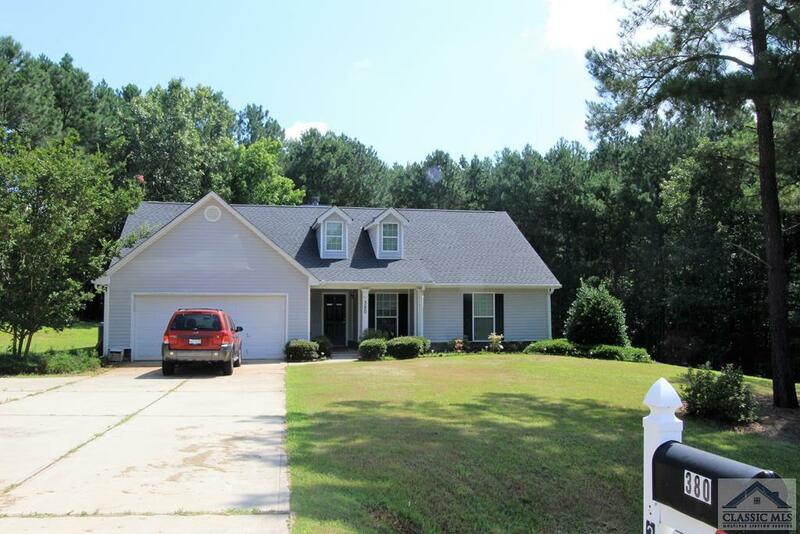 LISTING PROVIDED COURTESY OF Donna, Athens Classic Properties, Inc.
380 Pine Ridge Circle, Winterville GA 30683 is a Home, with 3 bedrooms which is recently sold, it has 1,512 sqft, 1+ - 2 sized lot, and None parking. A comparable Other, has bedrooms and 0 baths, it was built in and is located at and for sale by its owner at $ 0. This home is located in the city of , in zip code , this County Other, it is in the Subdivision, and Carlton Place are nearby neighborhoods.